Story update: The Travis County Commissioners Court at 12:32pm Tuesday September 25, 2018, voted 5-0 to approve Central Health’s FY19 budget and tax rate. That provides Central Health with the resources needed to proceed with plans to move sick clients now receiving healthcare services through the Medical Access Program to be insured by Sendero Health Plans Inc. MAP clients would have to voluntarily make the decision to receive care through Sendero’s network of providers. Central Health will pay the insurance premiums for those who opt to be covered by Sendero. “This is the face of a person who will die,” Alex Berek told Central Health’s Board of Managers, pointing his forefinger at his face while supporting himself with a walker. Berek was one of the 32 people who addressed the board at a special-called meeting Saturday September 22 during citizens communication that lasted more than an hour and a half. Many who spoke told their stories of pain, suffering, and near-death lifesaving healthcare they had received as a member of Sendero Health Plans Inc.
Five and a half hours after the meeting began, and after a lengthy debate among the managers in which the word “difficult” was repeated ad infinitum to describe their decision-making, the board voted to continue supporting Sendero for another year—but with built-in milestones to monitor progress and an understanding that if those milestones were not met, then the nonprofit health insurance company with 24,000 members would not get another chance. Managers Cynthia Valadez and Julie Oliver made passionate appeals to continue Sendero operations, but Managers Katrina Daniel and Sherri Greenberg were unmoved, initially. The debate shifted, however, when Manager Shannon Jones proposed to continue Sendero but with strict conditions he had written before the meeting started. That was a complete change of heart for Managers Daniel, Greenberg, Jones, and Maram Museitif, who at the September 12 board meeting had voted to wind down Sendero. The approved motion included approval of $6 million to pay the insurance premiums for patients voluntarily moved from the Medical Access Program to Sendero’s insurance. 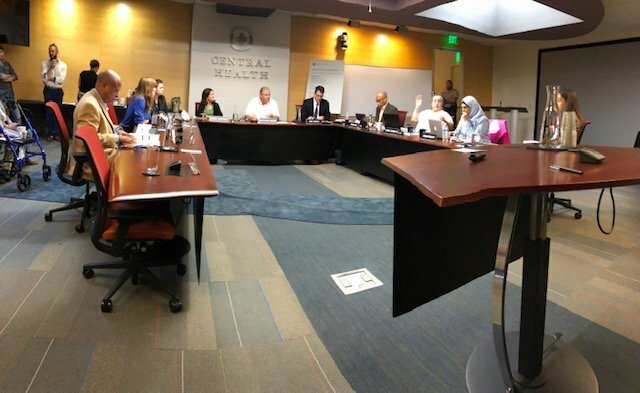 But the money is not to be spent until Central Health’s president and CEO, Mike Geeslin, has presented a viable strategy with “explicit outcome measures and objectives.” Reports on progress in attaining those objectives are to be presented to the board at least quarterly. By no later than June 2019, a third-party actuarial report is to be provided to the board to “inform potential wind-down or continuation” of Sendero. Further, if the goals are not met by June 2019, the board may adopt a resolution expressing its intent to cap future funding for Sendero. It also will cap premium assistance funding in future years to no more than $8 million. That was a far different decision than the one the managers arrived at September 12 at 10pm with no public input. The agenda item that night gave no indication that the managers might wind down Sendero and force its 24,000 members to choose other health insurance, possibly at a higher cost or with fewer providers in its network. Yet managers voted 4-3 that night to do just that. The resulting outcry caused the Travis County Commissioners Court on September 18 to delay its decision to approve Central Health’s FY19 budget and tax rate and instead order Central Health to reconsider its decision. Tomorrow the Commissioners Court will vote on the budget and tax rate (Items 50 and 51 on the agenda) and are likely to approve it without opposition. Left to right, Managers Shannon Jones, Julie Oliver, Katrina Daniel, Sherri Greenberg, Guadalupe Zamora, CEO Mike Geeslin, Managers Charles Bell, Cynthia Valadez, Maram Museitif, and attorney Holly Gummert. Sitting in that room and observing eight volunteer, unpaid board members debating at length was a refreshing change. Previously those discussions had taken place in closed-door executive sessions. Although Sendero is a nonprofit, it competes in the health insurance market with a number of for-profit insurers who have far larger memberships. Hence the need for protecting the privacy of its plans. Referring to what some have characterized as Sendero’s “losses” because Central Health has had to continue pumping money into it, Manager Katrina Daniel said, “I don’t like that characterization of ‘losses.’ We didn’t lose the money. It went to healthcare. “The question is it a sustainable and predictable way to fund healthcare?” Daniel said. She said that Seton currently bears the cost of in-hospital care for Medical Access Program (MAP) patients. She said if the sickest MAP patients are moved to Sendero, then costs of in-hospital care will also shift to Sendero and ultimately to Central Health for financial responsibility. “I don’t think that’s sustainable,” she said. She said that winding down Sendero would force many into bankruptcy. “There are overwhelming humane, ethical and moral reasons to continue the life of Sendero Health Plans,” Valadez said. Manager Sherri Greenberg was unmoved by Valadez’s pleas. She said, the “deck is stacked against” Sendero, due to factors beyond its control, including the state’s failure to expand Medicaid and the state’s low reimbursement rates. “Healthcare in the United States is broken,” she said. Manager Charles Bell, MD, is a member of Sendero’s board of directors and does not vote regarding its funding. But he was invited to speak in the debate about its future. It was at that point that Manager Jones laid out his proposal to fund Sendero for another year but with conditions. Daniel said of the open debate, “This is democracy at work” and indicated her shift to support the Jones’s proposal. Email [email protected]. This is his 14th article about Central Health and indigent healthcare arising out of his ongoing investigation that begin in early 2017.